It is still dark out, but after slipping into the cozy MoHo bed at 7 pm last night, I can’t sleep another minute. Outside temps are a mild 61 degrees, but I have a feeling it is cloudy and the wind is blowing in gusts and bursts. Here at Sunset Bay we have no internet and no phone, something I expected, but a fact that still takes a bit of adjustment. I can’t check the weather other than sticking my nose outside to get a sense of what the coming day might be like. I also have no idea when this post will actually get up to the internet, but thought it might be a good idea to at least write it before I have another big backlog of Oregon Coast camping to write about. While I was traipsing about the east coast, Mo was home, and she was definitely ready for a MoHo trip. This time of year, the coast seems to be the place where we are drawn, with no expectations of anything but windy, possibly rainy weather. Rain in Rocky Point is cold and can get snowy in November. Rain on the coast doesn’t often include snow, and has the added benefit of wild surf. Time to slip back to my week in Vermont before I completely forget the details. Thank goodness for photos. Wednesday in Vermont was to be simple, with a beautiful morning walk up the hills above Dorset to the orchard and then some explorations around the area. Several guests were scheduled to arrive this evening, and Jeanne and Alan were attending to pre-wedding tasks. In addition, they have another big project that needed a bit of attention, and Jeanne wanted me to see the site where the two of them are building their own home. When we were up in the airplane on Monday, they pointed the location out to me, high on the hills overlooking the valley below. The house on Alan’s property was first built on in the early 1700’s, when it was a tavern. The two of them wanted so much to keep the building somewhat intact, but it was an impossible task with mold and other issues to contend with. Instead, Jeanne’s task for the day was to flag the items they wanted to save from demolition. I loved seeing the old house, the old barn, and especially the hand forged square nails and hand hewn beams. The new house will be a timber frame, and they are going to incorporate the beams and some of the existing stones into the design. Can you imagine living in these Vermont mountains with a view like this? I was told the house will have a walk-out lower level that will be guest quarters, and I do hope I can get back again to visit and see the place when it is completed. In addition to the gorgeous view, the house has its very own swimming pond. I have never seen a pond quite like this one, absolutely crystal clear. With a diving board. Jeanne and Alan are excited about having their own home that is truly “theirs”, not one that was “hers” or “his”. Alan laughed with me about the old adage that building a house can break up a marriage, saying that the two of them are having a great time making the decisions and choices together and enjoying every minute of the process. With two people who love the natural world, I know that the home will be a treasure of local wood and stone, and that it will be filled with art from all over the world from their joint and separate travels. Exciting! I took some time that afternoon to explore on my own a bit, driving north to Lake St. Catherine to see if I could find the old Kinne Kinnic Camp on the northern shores of the lake. In the early 60’s, when Mo was teaching in China Lake, she decided to apply for a summer coaching job in Vermont. The camp was one of those tony places where wealthy folks send their kids while they travel in Europe. Mo had quite the summer teaching smartie-pants rich girls how to play tennis. As a born west coast, rather adventurous and outdoorsy young woman, I can only imagine what a culture shock that whole experience might have been. The telling part is that she only did it once. The original camp is no longer there, but an internet search turned up alumni including Joan Rivers among others. I found an original sign at the entrance to what is now a private housing development, and even with the photos, Mo couldn’t remember for sure which ones were part of her camp. The major acreage of the original camp is now Lake Catherine State Park. With the season over and the park closed, I parked outside the gates and spent a couple of hours wandering the grounds and taking photos. I had the entire place to myself, without another soul around. 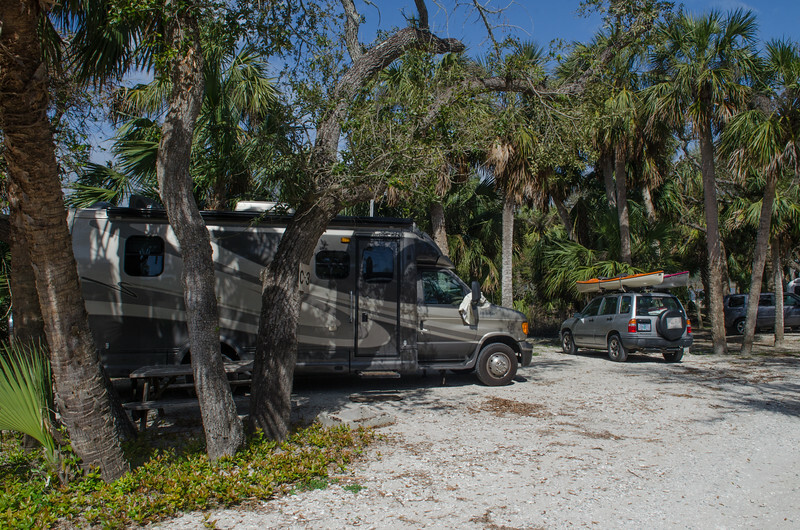 It is a beautiful park, with some very nice RV campsites, (no hookups), an easy place to launch kayaks, and trails for bike riding. I took photos of the best campsites, and of the original buildings, hoping that Mo might recognize some of them. The buildings were obviously much older than the state park, and I could only assume that they were from the original Camp Kinne Kinnic. Jeanne had warned me repeatedly about the typical fall outbreak of ticks in this part of Vermont, so I was careful to stay out of the brush. Still, I did walk through some tall grass, and sure enough I looked down and saw a creepy crawling on my pants leg. I checked carefully for ticks that night, but not carefully enough. The next morning, while taking my shower I was surprised to find a mole on my side that hadn’t been there the day before. Ack! I would imagine that little bugger was on my clothes and when I went to bed he found his way to my warm body. Ick. I called Jeanne and she said I needed to get to the emergency immediately to get it removed and that there was a high incidence of lyme disease in the area. Ack again. Walking up to the house to see what I could do and where I could go, I was greeted by comments, “Russell can probably help you”. Are you kidding me? was my first response. Russell had arrived the previous evening, a very attractive worldly guy with a great sense of humor, a new house in Greece, and a big box of baklava that he carried for 18 hours on the plane to share with all of us. I had completely forgotten that Russell was also an ER doctor. It didn’t take him long to get the tick out from a rather sensitive area, and he assured me that lyme disease was probably not a problem since the tick hadn’t been embedded for even 12 hours. whew. No antibiotics were needed, and the dreaded rash and bullseye ring never appeared. The next few days before the wedding were filled with people arriving, including Eve, from my very own town of Klamath Falls. Eve is an attorney in town and was one of Jeanne’s great running friends. My other housemates, Tei an Cecil, who live in the previously mentioned village of Waitsfield, also arrived. I had heard of Tei for years, knowing that she and Jeanne had been friends even before birth, as their mothers were friends when they were pregnant with each of them. Tei was even more delightful than I imagined, a tiny, athletic woman with huge talent and kindness. As the wedding drew closer, we especially enjoyed the special meet and greet evening at Alan’s house, where once again his master chef style came into play, and we had a Mexican feast worthy of royalty. Drinking, fun and laughter ensued as we all listened and told stories about Jeanne and Alan and their adventures. The next day, Jeanne wanted to show Eve and I more of the beautiful countryside. Even in the rain and clouds the colors were gorgeous, and seeing two more historic covered bridges not far from Dorset was wonderful. I also took some time to visit the nearby town of Manchester with another guest. Ellen had arrived from Key West and was staying at the Dorset Inn. We spent a beautiful rainy morning exploring the lovely New England town with great shops, a gorgeous gallery, and a fabulous yarn shop, Yarns for Your Soul. The only thing that kept me from buying skeins and skeins of hand dyed wool yarn was the thought that I would have to pay all those sales taxes and then try to fit it in my luggage. I did buy enough to make a couple of cute ski hats however, yummy stuff. Ellen and I had lunch at the local independent bookstore, Northshire Bookstore, a wonderful place with real books, real food, and great cappuccino. Ellen is another treasure. She and Jeanne met by chance on some world trip where they were assigned as roommates, and have traveled together since that time to many exotic world locations. I have heard Ellen stories for years as well, and was so happy that I finally got to meet her in person. It is from this point, however, that the photos of my visit deteriorate completely. I fell asleep the previous night with my camera on the bed. I had been looking at the photos I had taken, and somehow didn’t put the camera away properly. Sure enough, in the middle of the night, I heard a thump. UhOh. It wasn’t a long drop, and the hardwood floors weren’t that hard, but it was enough that the camera no longer worked. I had no time to find a repair place, so the rest of the week my photos came from the iPhone. I know that everyone seems to think iPhone photos are fine, but they don’t do that great in low light situations indoors at night, or in a church, or at a wedding. Lucky for me, once I returned home and took the camera to the shop, the only problem was that the mirror was stuck. I had tried dropping and lifting the mirror, but evidently hadn’t tried enough. The camera person had the camera working in minutes. Whew! Next: I know I keep saying it, but this time really: Wedding Rehearsal, Rehearsal Dinner, Wedding, and Reception! Somehow Jeanne and Alan were calm and collected as the wedding day drew closer. Everything was well planned and on schedule, and with a few more days before guests and relatives were to arrive, Jeanne had no qualms about leaving town for a couple of days to take me on a driving tour. Alan joked that Jeanne had given him a 26 page list of “things to do when Sue gets here”. With smiles and hugs of encouragement, he sent us off to play at “the lake”, and to explore some of the hidden gems of Vermont that Jeanne wanted to share with me. There is nothing quite as delightful as having your very own personal tour guide with an intimate knowledge of the countryside. Jeanne drove and I simply sat back with no agenda except for oohing and aahing as we passed through the countryside. Our first goal was Alan’s family place “The Lake Lodge” on the Vermont side of Lake Champlain, where we planned to spend the night. Our route took us a couple of hours north toward the southern end of the lake where Jeanne decided that I should see the famous Lake Champlain bridge. What a beauty! The visitor center was open, and with this being a holiday (Columbus Day), even on this cloudy, somewhat blustery day, it was rather crowded. The original bridge had to be rebuilt in 2010, and the new bridge echoes the shape of the old bridge beautifully. This area is thick with historical significance, with many forts and sites of pre Revolutionary War events. Across the bridge, on the New York side, we found the ruins of the French Fort St Frederic, built in 1734. There wasn’t much left to see, with the ruins buried by time and by the coming of the British, who occupied Crown Point in 1759 and began constructing one of the largest forts they would ever build in North America. Here the wooden and earth fortified walls were still somewhat visible, with the ruins of the stone barracks and officer’s quarters still standing. Even though she lived nearby, Jeanne had never explored this area and we thoroughly enjoyed wandering around the walls and ruins without benefit of the little tour guide to describe what we were seeing. Neither one of us felt like paying the fee to go into the museum to buy the guide. We had other goals in mind for the day. After leaving the forts, we didn’t dally much along the way, hoping to arrive and check out the water conditions on Lake Champlain. Big on my list was a kayak on this gorgeous lake, but once we arrived at the house, the winds were up a bit. Lake Champlain is big and can be surprisingly dangerous. We knew that our chances of still water were probably better the next morning rather than late in the afternoon, so we opted to wait for some time on the water. The house is wonderful, built some time in the 20’s, with lots of sprawling enclosed porches, cozy chairs for reading and watching the water, and plenty of bedrooms. I opted for the “maid’s quarters”, a sweet room just off the kitchen entry, chosen especially for the cushy down comforter and perfect mattress. Alan was glad to send us off, but of course was a bit jealous of our chance for time on the lake. He and Jeanne come here often to swim, read, kayak, boat, and fish. Over the last couple of years I have received countless photos from Jeanne of the lake from this vantage point, and it was wonderful to finally see it in person. We didn’t linger long, however, deciding that a country drive to the little village of Vergennes was in order. On the way, we inhaled the lovely fragrance of fields spread with manure, a common occurrence this time of year in rural Vermont. I didn’t find it unpleasant, though, somehow it fit perfectly with the beautiful farms in the valley of Lake Champlain. Jeanne took me to a favorite little haunt at a nearby state park, Button Bay, where we paid the $6.00 entry fee to drive into the park. It was the last day of the season, and we had the place almost entirely to ourselves. Just a short hike led to the rocky point jutting into Lake Champlain where we hunted for the fossils that Alan had previously found. We had no luck finding fossils, but the wild wind and waves on the lake and the dark clouds were incredibly dramatic and gorgeous. There is RV and tent camping at this pretty state park, although I would imagine it could get a bit crowded during warm summer days. There were no hookups, but a dump station and nice showers are available. We then meandered through the countryside to the nearby village of Vergennes, where Jeanne hoped to get some pastries at her favorite spot “Vergennes French Laundry”. Seems as though the place is only open a few days a week, and Monday wasn’t one of them. Instead, we opted for outside dining at the trendy little Three Squares Cafe. Specials for the day included a butternut squash and pumpkin ravioli, in a sage cream sauce with roasted veggies. Oh My Yum!! I must say Vermont food is some of the best I have ever experienced. Back to the lake house, we settled in for the evening with cognac and books in the big comfy chairs overlooking the lake. It was so nice to have quality quiet time in such a beautiful place with a good friend. The next morning dawned a bit cloudy, but the winds were gentle, and by 7am we had the kayaks on the lake. With just a bit of chill to the air, we paddled across the bay toward Otter Creek (actually it looks more like a river) and paddled upstream against the gently current. Jeanne told a great story about a time when the revolutionaries were in the bay and the British thought they had them cornered. Benedict Arnold, the commander at the time, dug a trench through the natural levee to Otter Creek, and his army escaped. We kayaked to a spot where remnants of the trench are still visible. It was a beautiful day on the water, and we stayed out three hours or so before returning to the lodge and packing up for the trip home. Jeanne still had much to share with me however, and her route back to Dorset meandered over the mountains to the Appalachian Gap overlook and down into the little village of Waitsfield. Even though Jeanne was technically raised in New Jersey, the house in the mountains above Waitsfield was her preferred childhood home. Here the family would come during the summers and on winter weekends to ski. Jeanne’s father took her skiing in a backpack when she was merely three months old, so she comes by her love of skiing naturally. Just up the road from the family home is the small local ski hill that Jeanne talked of so often, Mad River Glen. Once again, I delighted in seeing all the places I had heard about for so many years in person. The Mad River flows through Waitsfield, and the covered bridge across the river was another treat. We meandered around the town, visiting a few little shops where Jeanne found a perfect little dress for her rehearsal dinner. Isn’t is amazing to have a friend that slips a size 6 over her head so effortlessly?! While we shopped, Jeanne regaled me with some kayaking stories of her time on the rapids of the Mad River. Later she found the gravestones that were being hugged by trees in an old historic cemetery just outside of town. Sherry, I thought of you with these stones, instead of you hugging the trees, the trees are doing the hugging! The rest of the return trip to Dorset was through the back roads, along beautiful rivers, and down some dramatic canyons, where Jeanne again pointed out the names of the surrounding mountains where she hiked and skied. By the time we rolled into Dorset, it was late afternoon, and more wedding guests were beginning to arrive. As Alan said, when I arrived, he felt as though it was “really happening, the wedding was really happening”! But with the arrival of Alan’s best friends from around the world, Jeanne’s other friends from Oregon, and Tei and Cecil it was time to focus on the real reason I had come to Vermont. The wedding celebrations were about to begin! Next: I do a little exploring on my own and then its time for a Wedding! I had a year to get excited about my trip to Vermont. My friend Jeanne was getting married, and I knew I had to be there one way or another. The trip was wonderful in so many ways, and yet losing our sweet dog Abby, just a few days after my return, made it impossible for me to write about the beautiful days and the beautiful wedding until now. Some time has passed since Abby left us. We buried her not far from where our also recently deceased cat Jeremy lies, both small rock headstones visible from the kitchen window. The initial grief and sadness has eased a bit. The huge empty space that a beloved pet leaves behind is no less empty, but feels a bit less shocking. The house is very quiet. I did finally clean the dog spit off the sliding glass door, and just recently Mo put Abby’s toys away somewhere, I am not sure where. I think October is a beautiful month just about anywhere in this wide country. However the classic New England fall was on my bucket list. Mo and I have talked often of attempting to get back there in the MoHo, to fill in those last few states we have yet to experience in our rig. However the timing for such a journey can be daunting at best. It is always a juggle between catching the height of color and still not getting caught in the snows that follow. If we had attempted it this year, we would have no doubt been caught in the early snowstorms that are hitting the South at this very moment. Instead, I flew to Vermont on my own, while Mo spent the time caring for Abby and keeping the home fires burning, shutting down the sprinklers for winter, raking the rapidly falling pine needles and beginning the fall burning. I think I got the better end of the deal, except for Abby of course. With Jeanne’s wedding scheduled for a Saturday, I planned my trip to give me several days of Vermont time before the wedding and before the major influx of guests. When Jeanne lived in Klamath, and we worked together, she often shared stories of her life in Vermont. We were both excited that I would be there in time for Jeanne to show me her beloved home state. I was also happy for the time to spend with Jeanne and Alan and to get a taste of Jeanne’s new life. Flying from Medford, I flew to Portland and then got a nonstop cross country flight directly to Boston. Mo and I had been to Boston a few years ago, but it was on a cruise ship. This would be my first visit to Vermont, and I rented a car with the thought that I would drive the 200 miles or so directly to Dorset. I obviously wasn’t thinking clearly when I planned this, and realized that I needed to stay somewhere close to Boston rather than attempting to drive unknown back country roads in the dark of night. Finding a hotel in Boston was a bit daunting, with the cheapest rooms beginning at $329 per night! Not in my budget, for sure. I could sleep in the car if I had to pay that much for a few hours sleep. Instead, I drove an hour or so north toward Marlborough, and found a basic decent room for a mere $149. The bed was OK, but the room wasn’t much more than your average Super 8 out west that goes for 49 bucks. Still, when I woke the next morning to brilliant skies and gorgeous color in the trees, I was so glad that I waited. It took me nearly four hours to get to Dorset because I just couldn’t resist stopping a bit for photos along the way. It was my first time in Vermont, and the timing was very nearly perfect. The visitor center at the Vermont state line was state of the art, beautiful, and I began to get a feel for the rural nature of the landscape, and the focus on dairy farming, agriculture, and forestry that is the hallmark of this lovely place. On the winding highway along the West River I came upon the beautiful West Dummerston Covered Bridge, remembering that Vermont has more than 100 covered bridges, and that there are more covered bridges per square mile in Vermont than any state in the country. Of course, after our springtime covered bridge tour of Oregon, I couldn’t miss taking a photo of this lovely bridge. I learned later that it is the second longest covered bridge in the state, but at the time I was taking the photos, I only remembered some of what I had previously learned about trusses and joists and supports. I loved the open window on one side of the bridge especially. Alan’s home on the hill above Dorset. I really had to make some tracks because the weather was cooperating perfectly for Alan’s offer to take me up in his airplane that afternoon. It was a gorgeous, completely cloudless sunny day, and the rest of the week was forecasted to be rainy and dreary. No time to waste. If I was to see Vermont from the air, I would need to do it on this beautiful Sunday afternoon. I arrived at Alan’s place by noon, and after greetings and settling in to his brother’s home down the path, Jeanne and I walked to town to the local farmer’s market to get some veggies for supper. Alan was brining a beautiful “happy chicken”, and only fresh grown organic veggies would be worthy of the meal. Dorset is a beautiful small burgh with lovely historic homes and inns, winding country roads, a town green, and lovely historic churches, one of which would be the location of the wedding the following weekend. My home for the week, just down the path from the main house. My home for the week belonged to Alan’s brother, at the moment traveling around the world on a sailboat, and later the three bedrooms would be filled with other wedding guests. It is a dramatic timber frame home, with great views of Mother Myrick towering over Dorset. Within a short time, the three of us piled into Alan’s new truck for the drive north to Rutland airport. Needless to say, I was excited. Flying in a small plane is thrilling to me, and as a map maker, seeing the landscape below up close is magical. Alan is a forester, and his understanding of the patterns of the vegetation, his explanation of the various timber communities, and the history of the logging industry in Vermont added tremendously to the flight. Alan was excited about the flight as well, exclaiming over and over how incredibly lucky we were with the clear skies and the beautiful color playing out over the mountains. Alan and Jeanne pointed out the local mountains, and told some sweet stories about their first hike together on Haystack as they flew past the dramatic glaciated peak. It was a perfect introduction for my week in Vermont. After our flight, Alan drove some of the back country roads around Dorset, searching for color on the hillsides. I learned that Vermont was almost completely denuded of forest when it was first settled in the 1700’s, with more than 80 percent of the state being cleared for agriculture. In the ensuing years, the trees have once again taken over the landscape and there is now only about 25 percent of the state cleared for agriculture. I knew I wanted to see New England stone walls, but what I didn’t know was that many of those old walls are found in the forests, marking what were once open fields. Now taken over by the forest again, the old stone walls are crumbling and tucked away in the shadowy undergrowth. After that breathtaking afternoon, we returned home to Alan’s place to partake of one of the most amazing roast chicken dinners I ever experienced. Alan is a fabulous cook, and his favorite resource is Cook’s Illustrated, also a favorite of mine. I have never ever ever in my entire life had such a succulent chicken, set off with Jeanne’s homemade cranberry sauce and fresh beets from the market. The gravy (another favorite food group of mine) was beyond incredible. Thus began a week of some rather fabulous meals, both home cooked and at inns and restaurants throughout Vermont.